It all started with Walter W. Thayer Sr. He traveled and sold Industrial Woodworking Machinery throughout the Midwest for Yates American during the 1920’s, 1930’s and 1940’s. He started W W Thayer Company in 1946. Walter W Thayer Jr. came on the scene shortly after his father passed away in 1949. The next generation including Wally, Jim and Jeff started in the 1970’s and 1980’s. 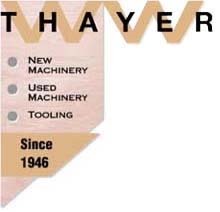 Then and now W. W. Thayer Company was, and is, committed to providing Industrial Woodworkers with cost effective - profit producing woodworking machinery solutions; offering the leading brands of Industrial Woodworking Machinery, Panel Processing Machinery, Tooling and Abrasives, along with the all important parts and service to back them up. In addition to new machinery we have a large offering of late model used machinery. Please take the time to browse our website, we probably have the machine your shop needs at a considerable price savings to a comparable new machine. Looking for tooling? Please take the time to browse our latest addition to the W. W. Thayer Company line up, www.toolsxp.com. Shop online 24/7, when it is convenient for you, offering the leading brands of tooling and abrasives at competitive pricing. See how easy it is to save time and money. All of us at W W Thayer Company appreciate your visiting our website. Call us at anytime, we are eager and ready to go to work for you.